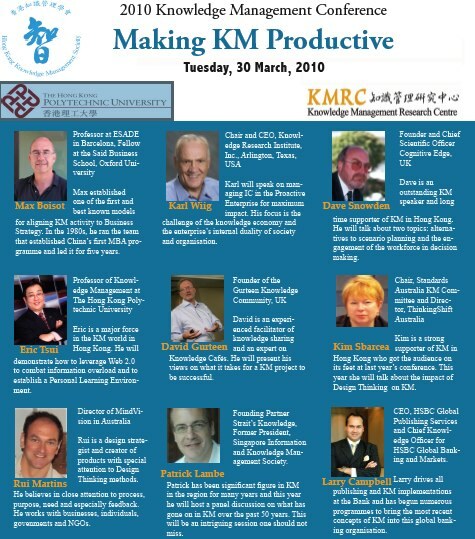 So at the end of March/early April, you’ll find me in Hong Kong again speaking with the luminaries of the KM world – Dave Snowden, Max Boisot, Karl Wiig and David Gurteen. You can download the brochure here. I must say that my hair isn’t quite THAT orange (reminds me of Lucille Ball) and I seem to have been spread sideways a bit. I hate my photo being taken and that one is particularly dodgy as it was a “posed” work photo taken for an internal KM campaign. Note to self: get a newer, better photo. I’ll be live blogging from the conference, so will bring you all the fabulous sessions and juicy bits and pieces. And I’ll be live tweeting using #HKKMS10 (no doubt my tweets will also include things like “Managed to avoid The Brands at Harbour City”). So mark Tuesday March 30 in your diaries as KM Day with Kim. Entry filed under: Conferences, Knowledge Management. Tags: Hong Kong, Knowledge Management conference. Good to see you are into Design Thinking Kim. As a Graphic Designer its always been wonderful to be able to formulate a problem with divergent thinking, and a holistic approach, before moving into a convergent solution mode. The other thing I’ve found of benefit is the ‘user-centred’ orientation of Design. I guess it’s why I’m naturally drawn to Action Research and Agile methodologies when looking at ICT projects, always rejecting the project management mantra of narrowing the scope. I’m think I’m starting to understand Ralph Stacey on a very superficial level! Thx Andrew. I’ve loved Stacey’s work for years. Thankfully, I have a design thinking expert speaking with me, otherwise I’d be toast! I will do a post on what we talked about post-conference.